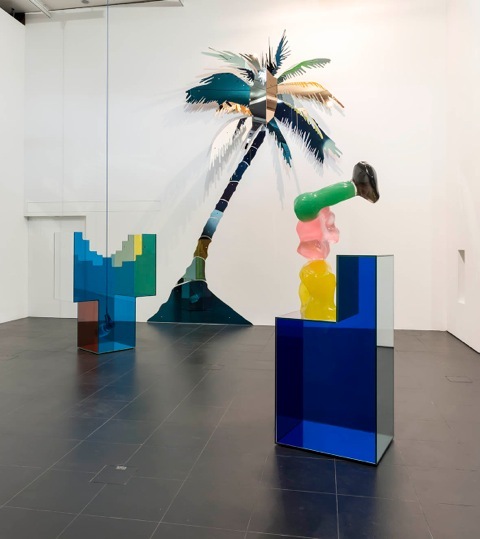 Gary Webb, X7 City, installation view at Bloomberg SPACE, London, 2014. Image courtesy The approach, London, © the artist. 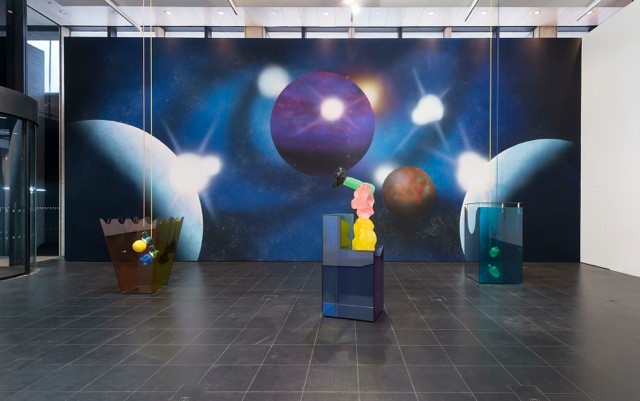 Bloomberg SPACE in Finsbury Square London is a fairly uncompromising, corporate architecture that might at first look as if it offers the ideal neutrality for showing contemporary art, but can in fact sometimes prove too weighty an opponent. Gary Webb’s current show grabs the space and makes it his own. 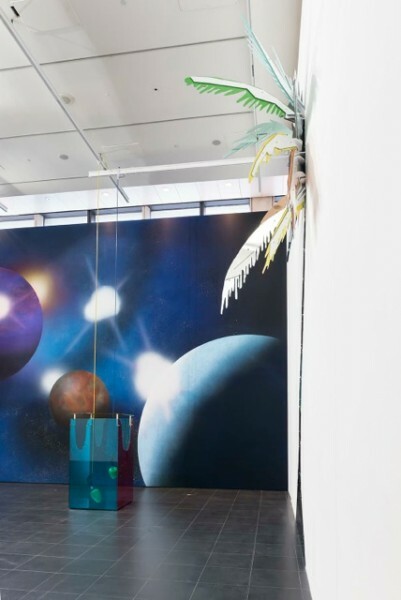 One wall of the show is a giant wall painting of some imagined intergalactic landscape, while two other walls host huge, but probably life-size, palm tree forms, fabricated from sections of mirror. 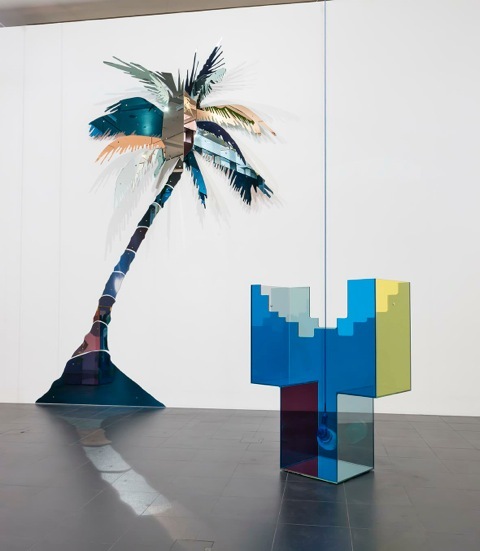 Palm trees have proliferated in Webb’s work since the early 1990s and in conjunction with his sculpture are for me redolent of late 1930s Miami Art Deco, but you can fill in your own fantasy of an exotic, palm-fringed locale. 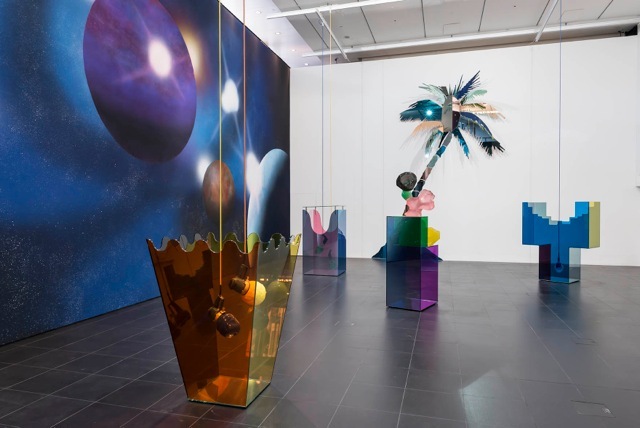 This show is notable as a significant development in Webb’s work – incorporating new kinetic devices that have produced an apparently unanticipated sound element. Inside deliciously colourful box-like structures of toughened glass, which play spatial games with you as you walk around them, power tools gyre and gimble great knobs of primary-coloured rubber. As these glossy forms collide randomly with the glass, they become for all the world like giant, John Cage-inspired timpani. The effect is incredibly pleasing. The viewer can stand in the centre of three of these works as they jiggle and bounce, and be entranced. Gary Webb is not an artist you might automatically associate with power tools, and this new work is no swerve in to some more macho visual language. A Makita might be one of the tools of his trade, but Webb uses the electric drills here with a formal playfulness entirely at one with his manipulation of glass, steel, brass, mirror and acrylic. Einstürzende Neubauten this ain’t. Think instead of the great Phillip King RA – the form of one of the sculptures recalls his iconic 1963 sculpture Ghengis Khan – and his pictorial, polychrome sculpture of the 1960s. Identified in the late 1990s, alongside artists such as Eva Rothschild and Claire Barclay, as part of a group that were doing something quite new in object making, it seems very timely now, with a new generation snapping at their heels, to touch base again with Gary Webb. This Bloomberg commission has afforded him an opportunity to seriously kick up a gear and revel in the double height space: here, big is beautiful. Do go and see – it’s a fail-safe, colour therapy antidote to the awful weather.